The new Abia state commissioner of police, Anthony Ogbizi, has warned that anybody found with the Biafra flag will be arrested and charged to court. Speaking while parading seven suspected members of the Indigenous People of Biafra, Ogbizi said the declaration of IPOB as a terrorist organization and the proscription of the group by the governors of the South East automatically makes it illegal for anyone to operate under IPOB or adorn Biafra flag or emblems. “Nnamdi Kanu and his brother, engages in photo-shopping. They thrive through propaganda. They say IPOB is an armless group doing protests, but you have seen it yourself that the group is violent. They set bonfires on the road and attack with offensive weapons. IPOB destroyed the Ariaria Police, they were armed with petrol bombs which they used to destroy Police and exhibit vehicles. They also carted three pump action rifles and threw a petrol bomb on a patrol vehicle conveying MOPOL men. You can see the destruction of commercial vehicles. IPOB coordinated these attacks from Nnamdi Kanu’s house. IPOB members confronted the military at Isiala Ngwa. Look at the attack on the bank, we don’t know the motive. 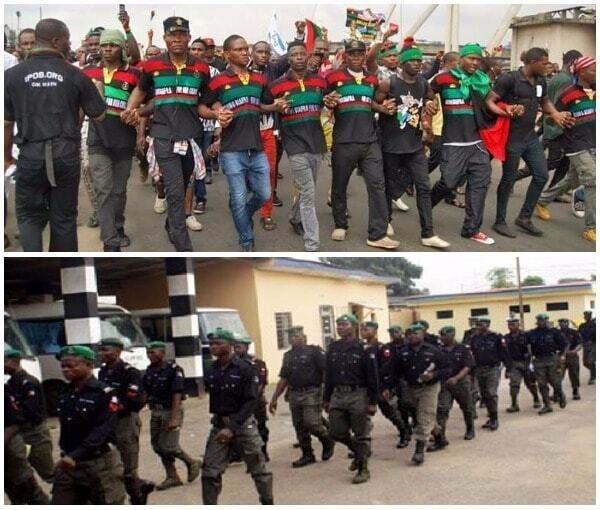 The police commissioner further added that one of his officers, an assistant superintendent of police injured during the crisis between suspected IPOB members and security operatives in Ariaria police state, Aba, has died from his injuries.